The Worst Blog Ever: The Worst Font. Written by the worst Blogger ever. The product of a diseased mind. 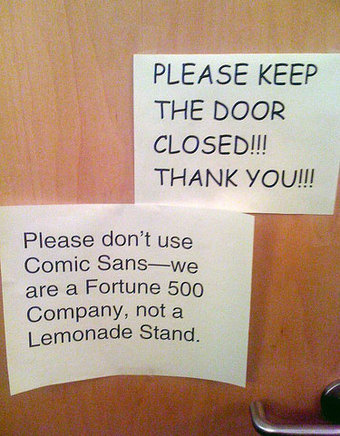 Oh, Comic Sans MS, how I hate thee with the burning passion of a thousand nerds. It is the very thorn that twists in the side of all those web-browsing citizens who would read digital text for their personal entertainment and enlightenment. There are, according to Encyclopedia.com (which must be right, because it's on the Internet), there are tens of thousands of fonts available to the god-fearing public to consume, process, and enjoy. But of this steaming pile of unreadable, bizarre, poorly designed digital affronts there is one that outshines them all: Comic Sans MS. I will not be using the offensive font here as an example for two reasons: 1) Everyone on the Internet already knows what horrible thing I am referring to, and showing it here would just cause them to lapse into a mouth-frothing rage/despondent wrist slashing depression and 2) Blogger.com doesn't allow Comic Sans MS on its list of approved fonts in its WYSIWYG blog-post-editor-thing. However, there is a very slim chance that you don't know what I am talking about. For you lucky few, just open up a comic book written in the last few decades. That casually written lettering coming from most of your favorite heroes, villains, and distressed damsels is probably something very similar to Comic Sans (hence how it got its name: It's lettering from Comics and it is Sans-Serif). As someone with only a very passing knowledge of the comic book world, it took me a while to realize that this is where the devil spawned forth. Who knew? I'll admit, this lettering is somewhat charming coming from the efforts of your favorite comic artists. It would be hard to relate to characters who spoke in Times New Roman, which seems so formal and... well typed. But this rant isn't about the perfectly legitimate usages of the terror-font. That's because there is only ONE place where it is acceptable, and that is in comic books. I can recall a time in high school, we were all bright eyed youths then, computers were exciting and new - and the teacher had finally relented and declared that we may use a computer to compose our reports and print them, thus not having to write them by hand any more. Oh the joy. Our collective hands, so gnarled and warped from grasping at archaic #2 pencils for endless hours, seemed to sag with relief at the news. And what did our teacher get for her great act of charity? No less than four of those reports were submitted, in their entirety, in 14pt Comic Sans. I died a little inside. The teacher immediately retracted her offer and from then on we were required to scrawl the reports out on paper. There is some hope. These recent years have seen a decrease in websites using the terrible thing - perhaps due to the overwhelming consensus of experts. A simple bit of Google-researching has shown me over two million pages on the subject, the first few pages of which even seem to be related to the subject at hand. Want to read more about Comic Sans MS? Dear God, why? I love Arial, sue me, I love me some red-heads. Oh, the font! Yeah, its a good font if it is used sparingly. People need to learn when to use serifs, when to use sans-serifs, and what the hell a serif actually is. Yeah, Arial is overused. But I'll take Arial over Comic Sans MS anyday. The WorstDanEver is an American living in Japan where he is probably the worst junior high school teacher ever. Heroes Have No Homes A blog, with words in. Who would steal this anyway?. Simple theme. Powered by Blogger.